If you've played online CS: S for very much time at all, you've probably noticed that some people are able to own you with only a knife, even though you try to hit them with every gun in the inventory. "OMG" you say, "How the heck can they do that? They must be hacking!" Well . . . possibly. Most likely they have simply learned the tricks that separate the pro's from the newbs. If you're interested in learning those tricks then read on. To begin, there are two different ways to stab with the knife, (1) The Soft Stab is achieved by clicking the left mouse button. (2) The Strong Stab is achieved by clicking the right mouse button. Though the soft stabs come much quicker, they only take about a eighth of the players health at best. 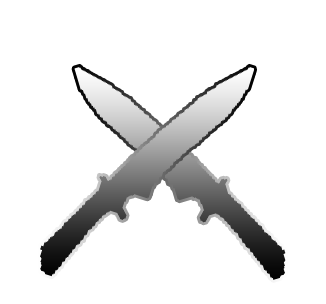 The strong stab comes slowly, but takes over half of the opponents health. Also, note that a strong stab directly in the back is an instant kill, that is, it takes 165 health from the recipient. However, since knife kills give the inflicter 25 extra health, it is possible to survive a back stab if your health is above 165. Most of the time, if not all of the time, you are going to want to use the strong stab. In some servers, they deactivate clipping in players so that you are able to walk right through them. In servers like these, you want to strong stab the player once as you approach the front of them, then turn around 180 degrees as you pass through them, and strong stab them in the back before they have the chance to turn around. An extremely important part of knifing is the way you approach the player. When you strong stab it'll be about one second before you are able to do it again, so it is very important to hit the opponent the first time you try. You don't want the other player to be ready for you (the element of surprise). So you do what is called "dancing". This means that you go in a circular pattern around the player, getting closer to him, then further away; going in one direction, and then another. Never move in close enough until you're ready to make the kill. Then when you think the time is right, move in and conquer! For an interesting (though not very useful) knife trick, click on the link below.